Expanding advertising opportunities throughout luxury shopping centers. Digital media network at one of the world’s most glamorous retail complexes. 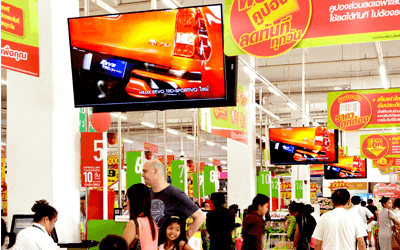 Raise brand awareness & capture consumers at point-of-purchase of 11 shopping destinations in well-identified locations; Bangkok and in major cities throughout Thailand. 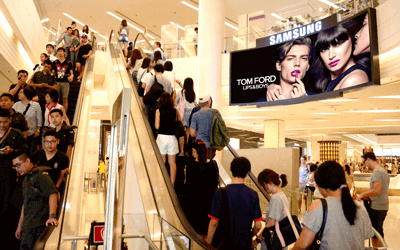 Engage the trend setter audiences with digital screen network coverage the ultimate & premium shopping destination. Communicate to the right audiences at the right moment. Innovative advertising media in washroom at affordable access. Build up brand image and reach high purchasing shoppers in the premium shopping center. Enable brands to reach targets in a high dwell time environment at the largest low rise shopping center in southeast Asia. Sale conversion opportunities for brand throughout the stores.